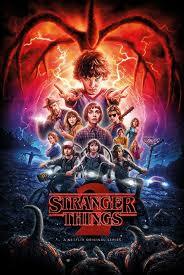 TV & Film posters – Stranger Things posters: Stranger Things one-sheet poster for the second season of the hit Netflix TV show. This promo-style poster features the main characters including Eleven, Mike, Dustin, Joyce, David and many more. Official Stranger Things poster. Approximate Dimensions: 61cm x 91cm.